Vitria OI is the only fully integrated platform that blends capabilities for continuous, real-time analysis of both streaming and stored Big Data, combined with the ability to take immediate process-based action on the discovered insights. 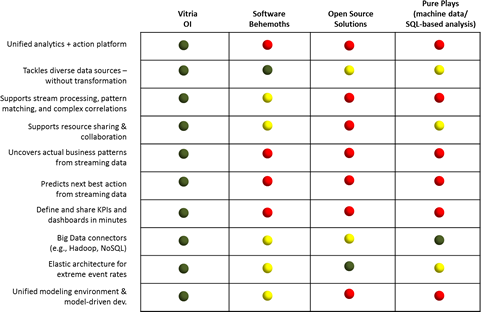 Unlike offerings from the software stack vendors, open source vendors and other Operational Intelligence solution providers, Vitria OI lets you uncover and analyze actual business patterns from live, streaming data and proactively respond. Why Consider Vitria OI for Streaming Big Data Analytics? By eliminating the latencies involved in the data aggregation and persistence techniques used by traditional analytics tools, Vitria OI delivers insights into real-time streaming data with almost no latency. The high performance CEP capabilities enable the processing of massive volumes of streaming data to support even the most challenging Big Data in Motion applications. Each Vitria OI component can be scaled independently in a distributed architecture to meet the specific needs of different Big Data applications. These components can be elastically scaled with minimum impact on running applications. They can be distributed on commodity hardware to maximize scale while minimizing cost. Vitria OI’s Hadoop connector allows the solution to work synergistically alongside Hadoop. While Hadoop delivers deep insights into massive volumes of stored data, Vitria OI complements it by providing continuous, real-time insights into streaming data together with the ability to take proactive, automated action. 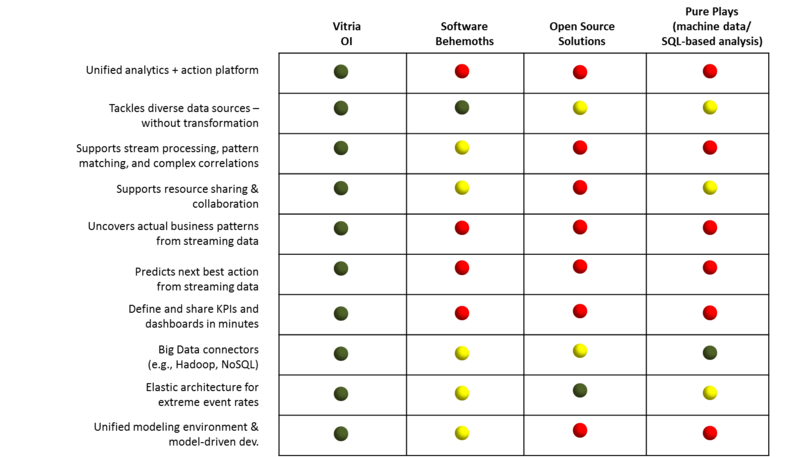 The Hadoop connector allows data streaming into Vitria OI to be persisted in Hadoop, and queried to provide historical and baseline analysis. Data captured by Hadoop can also be streamed into Vitria OI, which provides instant analysis and timely detection of opportunities and threats. Data streamed from Hadoop can also be used within the powerful Vitria OI Apps, which empowers business users to directly create value from Hadoop data. Vitria OI’s connector framework allows for rapid integration with an organization’s existing business intelligence (BI) and data warehousing infrastructure, NoSQL databases and other Big Data frameworks. The Development Workbench enables developers to use a graphical, model-driven approach that facilitates rapid, collaborative development and deployment of custom OI applications. OI Apps provide immediate access to streaming data insights to business users without requiring any developer support.